This morning the L.A. Times Guild organizing committee sent a letter to Tronc’s board outlining our concerns with the “pyramid” plan unveiled last week at an investor conference in New York. You can read the letter below. With our union vote firmly behind us, Lewis and Mickie can no longer use it as a reason to avoid communicating with the newsroom about this plan and our possible office move. That communication should happen soon, it should be in a meeting where Los Angeles Times journalists can express direct and honest feedback, and our questions should be answered candidly. More than anything else, our landslide victory in the NewsGuild election demonstrated the newsroom’s deep devotion to the mission of safeguarding our journalism. 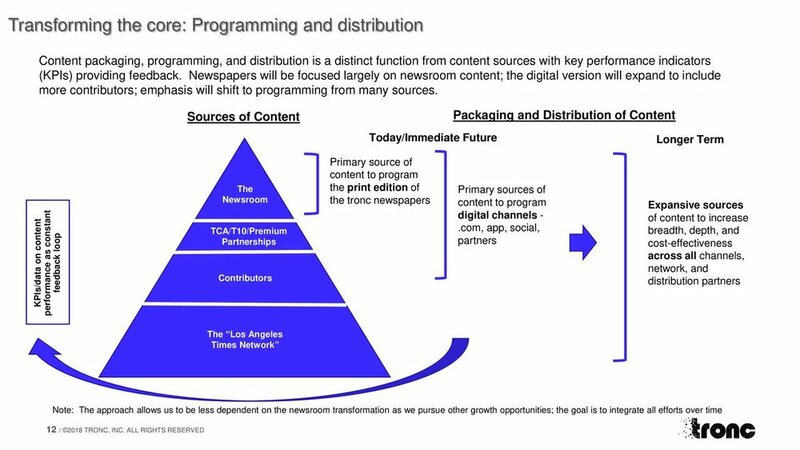 We believe Tronc’s “pyramid” or “triangle” plan for The Times would cheapen our journalism, damage our brand, betray our readers and ultimately shortchange our shareholders. The company should abandon this plan now. If Tronc chooses not to, be advised that the National Labor Relations Act requires the company to give notice and negotiate with the Guild over the components and implementation of the plan. That’s because the plan clearly entails the potential shifting of newsroom duties to non-union employees, including freelancers and contractors; possible layoffs and the reassignment of Guild-represented staffers; and a threat to the ethical standards that inform our working conditions. The plan was developed without any input from the talented, knowledgeable and resourceful journalists in our newsroom. We learned about it only after Ross Levinsohn unveiled it at an investor forum in New York. It is essentially a version of Lewis D’Vorkin’s controversial model for Forbes. We are far from alone in believing that model devalued Forbes’ journalism by sullying it with unpaid contributor content, pay-for-clicks schemes and troubling presentations of advertorial. We wonder if it actually delivered lasting financial returns for Forbes. Just last week, a pioneer of unpaid contributor content, The Huffington Post, announced its decision to no longer use the material. HuffPost said such content diminishes the site’s journalism. Imposing the Forbes model on The Times would destroy the newspaper’s credibility and undermine our prospects for economic stability over the long term. What works in these difficult times for our industry is plain to see: A commitment to and investment in first-rate journalism. Look to The New York Times and Washington Post for proof.